I am not sure I can ask for much more. I have #1 Blogville and Facebook friends. I get hugs and kisses like crazy. My doctor is awesome, plus she is blonde, BOL. I have the bestest friends. All my friends got my back. 2. Go to the Grand Canyon. so we could all have a virtual hug pawrty since we can't all hug in the person. I decided to bring my brother to the Grand Canyon. I will show you more pictures later. Now I get it! You went to the Grand Canyon for Chubby! We know Benny was with you every inch of the way! How is your little knee? I'm glad Benny got to go! I bet he's looking down from the Bridge and wiggling! Awesome - and bittersweet! We've never been there before and really want to go! Oh wow so glad you got to go! We agree pawsome and bitter sweet. We think he is looking down on you and smiling that sweet smile. Bless him. Thank you for bringing Benny to the Grand Canyon - that was magnificient in more ways than one. Awwww what a sweet sister you are!!! We want to go to the Grand Canyon ... it looks pawsome! We are glad that you got to take Benny with you ..
Lily I hope you took a good book to read...87 hours is a very long time. That was great that you brought Benny to the Grand Canyon. It looks beauitful and we would love to go there too. P.S. We have paws crossed your knee is feeling better. Sooo sooo happy you got to go, Benny is smiling right now. Hope your knee is better soon! Lily, we thinks Benny is very happy right now. Thanks for sharing the pictures with us. That was a bittersweet trip. I hope Benny and my Baby Brutus are bestest friends over the Rainbow Bridge. You look very fashionable! I am glad you are seeing these amazing things for your brother Benny - I'm sure he's there with you! I am sure your Benny is watching you very closely, and enjoying you enjoying your trip. I'm so glad that you got to see the Grand Canyon for Benny. WE KNOW that Benny was Right Beside you the entire time. You really look Fangtastic in the Pictures... You have quite the wardrobe. As you show us more pictures... WE will be able to feel we are there ALSO. That is one really awesome place, we bet Benny sure was happy to be there with you guys! That was such a nice thing to do for Benny. We know he was right there with you in your hearts. We would love to see more pics, but rest up - that sure must have been a long ride. Lily & Mom, that's the sweetest thing to do. We know that Benny was there with you every step of the way. It's pawsome to see you and Mom smiling. Your smiles warmed our hearts!! That's precious and very special. Hugs to all. Dear Lily, I know that Benny entrusted you to carry on in his steps...so girl you keep doing all those things he loved. I missed the hug fest but Hunter and I send big hugs to you and your mom today. May this new year be filled with health, joy, love, walks and happy times for you both! A make a wish true that came true! We are so happy you made the trip!! Benny is always with you, always. We miss him, and I bet that you'll miss him forever. I think it's so sweet that you went to the GC in his honor and memory. OOo what a great bucket list! HNY 2014! You sure are rugged up, Lily! Great adventure. Wishing you a happier 2014. We love you. 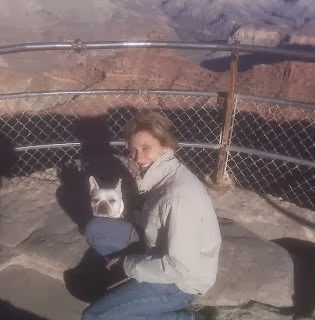 Lily I LOVE that you are fulfilling Benny's bucket list.....taking him to the Grand Canyon was magic....I know you'll get that WHOLE list done....for your Benny. You're the BESTEST! Oh Lily...you helped Benny complete his bucket list! He got to go to the Grand Canyon. How fantastic! You are the bestest sister a dawg could ever wish for!